JRA Day December 5, 2015! JRA Day is next week! On December 5 at the Woman’s Club of Chevy Chase invite all to see the work of more than 35 artists working across the craft media. These special artists – including 10 new artists and artists who have shown their work at the ACC Baltimore Show, the Washington Craft Show and SOFA Chicago – will have their incredible work for sale at this free event! 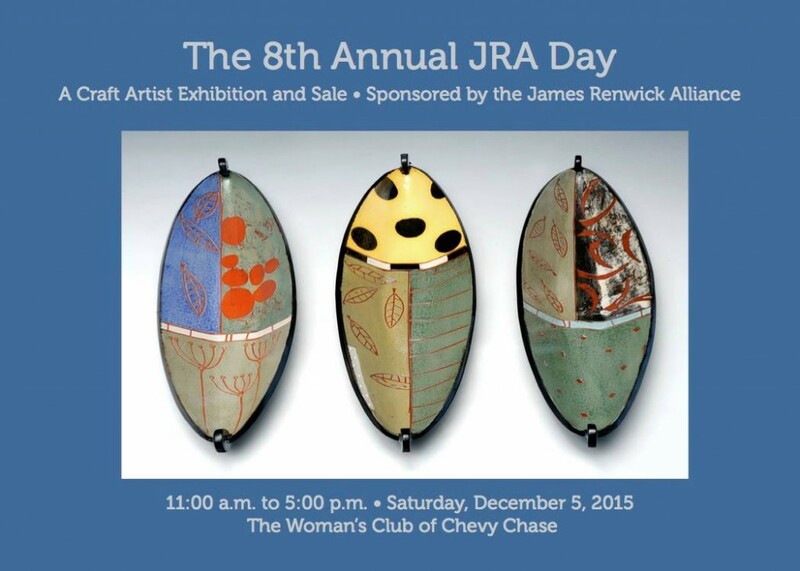 JRA Day is a one-day showcase for artists who are members of the James Renwick Alliance. 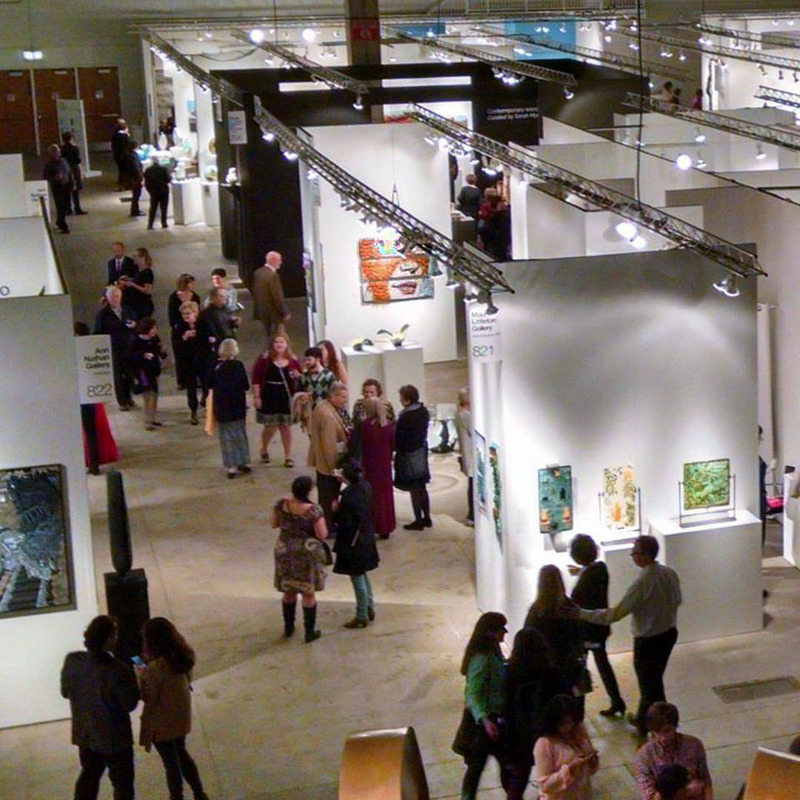 This event gives the public the opportunity to see and purchase work by artists in many media. For more info – click HERE to jump to the JRA Day page. There is also a Raffle – featuring prizes that are works of craft art by local artists – David Fry, Clara Graves, Allegra Marquart, Laura Peery, and Chris Shea. 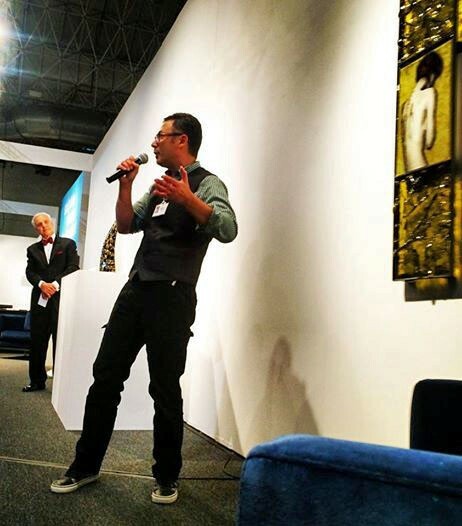 The James Renwick Alliance is an independent national nonprofit organization that celebrates the achievements of America’s craft artists and fosters scholarship, education and public appreciation of craft art. The JRA was founded in 1982 and is the exclusive support group for the Renwick Gallery of the Smithsonian American Art Museum, our nation’s showcase of contemporary American craft. Since its founding, the JRA has donated more than $3 million to the Renwick Gallery, and it has supported the purchase of more than 175 works for the Renwick Gallery collection. The JRA also supports public programs in craft, including its annual Distinguished Artists Series, which brings craft artists to Washington, D.C. for workshops and lectures. For more information on the JRA, including a calendar of events and how to join, go to theirweb site at www.jra.org or visit on Facebook. Visit the Washington Glass School and all the surrounding artist studios for the Holidays! On Saturday, December 12, 2015, from Noon til 5 pm, the (always creative!) 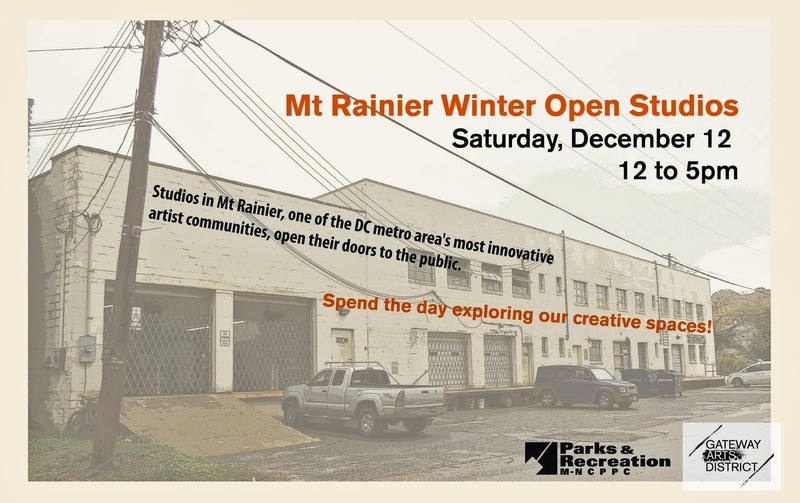 Mount Rainier artist studios will all be hosting Winter Open Studios! Visit (and shop) in some of the most creative studios in the Washington, DC area! 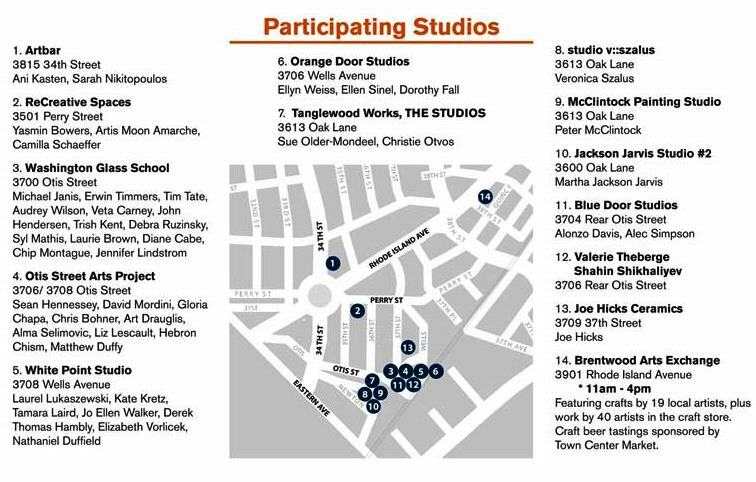 Participating studios include: Artbar, ReCreative Spaces, Otis Street Arts Project, White Point Studio, Orange Door Studios, Tanglewood Works, Blue Door Studios, and more! Nearby Brentwood Arts Exchange has their craft store and will have specialty beer tastings sponsored by Town Center Market. The Washington Glass School will again feature works by our artists and instructors – including Michael Janis, Tim Tate, Erwin Timmers, Audrey Wilson, Veta Carney, John Hendersen, Trish Kent, Debra Ruzinsky, Syl Mathis, Laurie Brown, Diane Cabe, Chip Montague,Todd Piantedosi, Jennifer Lindstrom. Make a point to Celebrate the Season! 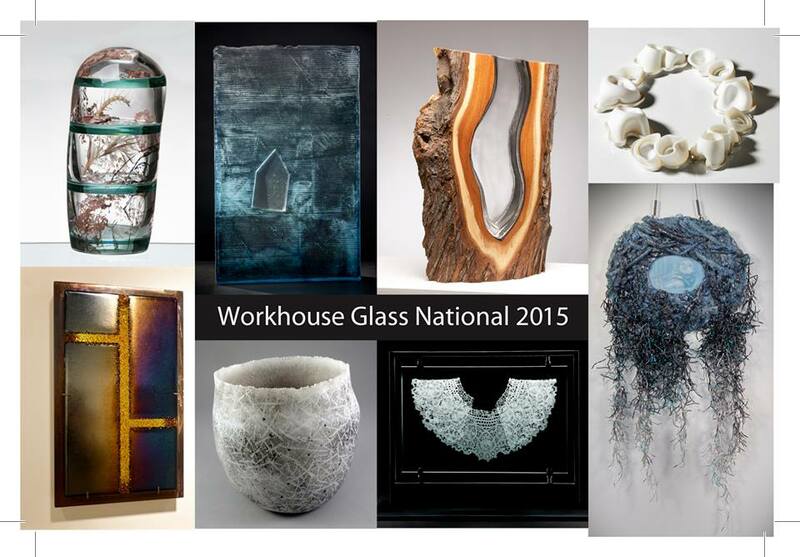 Lorton, Virginia’s Workhouse Arts Center opened its 1st Annual Workhouse Glass National Exhibition reception this past weekend. The exhibit was created from an “Open Call” for functional and/or sculptural glass artworks, juried by the legendary gallerist, Maurine Littleton. Featuring a range of contemporary glass artwork currently being created throughout the United States of America, Washington Glass School is proud that works by two WGS Resident Artists, Veta Carney and Diane Cooper Cabe were among the artwork selected for the exhibit. Congratulation to all the artists! Chicago’s Navy Pier was host for the 2015 SOFA expo. 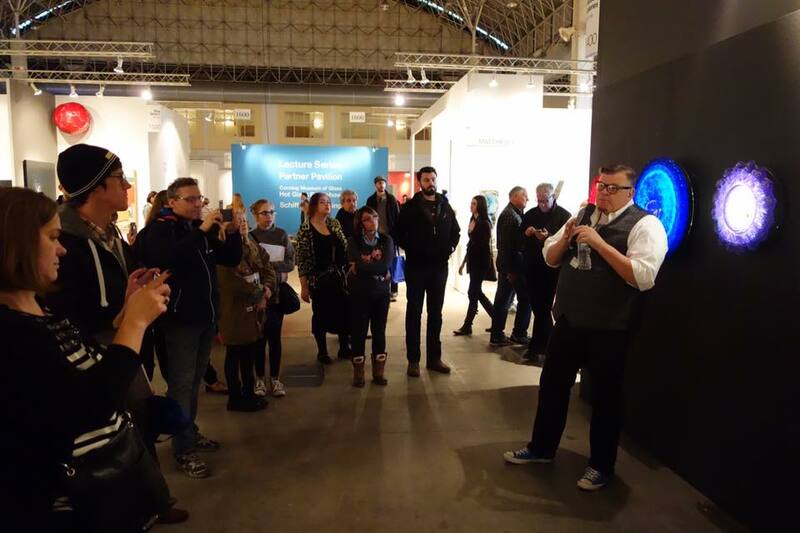 As the 2015 edition of the Sculpture Objects Functional Art + Design fair wound down the red dots were spread around the exhibition spaces at Chicago’s Navy Pier Festival Hall that featured glass. The broadened scope of works included more painting and photography as part of the show’s evolution. 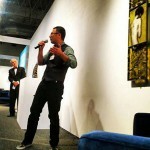 Tim Tate talks about his work at Habatat Galleries space. 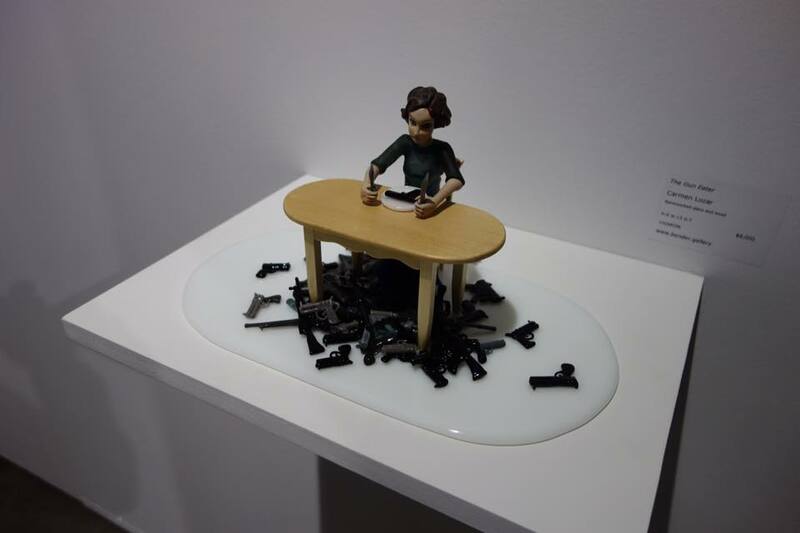 Washington Glass School artists Tim Tate, Michael Janis, Allegra Marquart, Audrey Wilson and Sean Hennessey were featured at Michigan’s Habatat Gallery, Maurine Littleton and Alida Anderson Art Project spaces that featured works by internationally acclaimed artists. 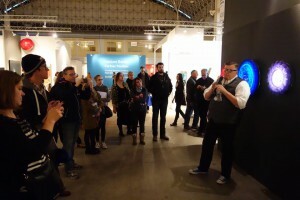 The art expo also featured talks by the artists about their work and notable critics such as William Warmus and American Craft Editor Monica Moses hosted lively discussions on the future of collecting. 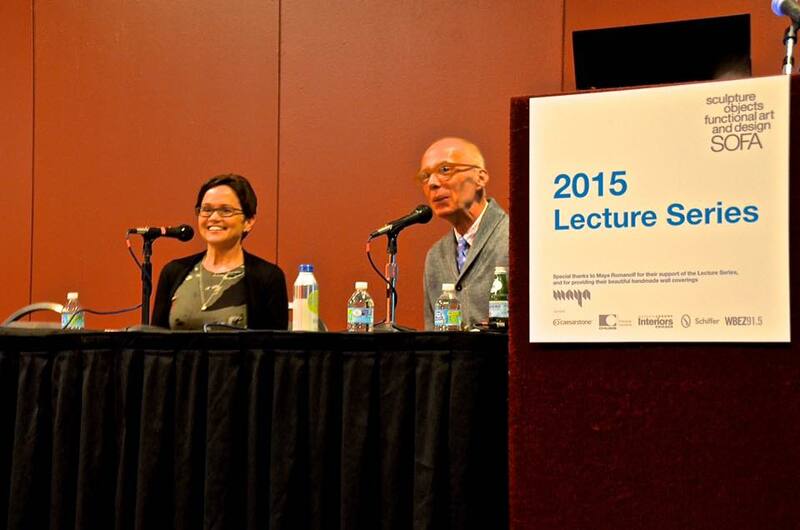 Editor-in-Chief of American Craft, Monica Moses, with curator/critic/art consultant Bill Warmus presenting a talk about the future of collecting @ SOFA Chicago 2015. One of the best activities for this visitor was to wander amongst the incredible artwork and strike up a conversation with the artists that you had a craft-crush and obtain real insight into their work and process. Some of the works truly left the viewer gobsmacked – with details and depths to the work that jpeg photos simply could not show. Although the show was just a long weekend, I could have kept finding new works to be mesmerized in each aisle. I can’t wait till next year’s iteration! But until then – have a look at some of the glass works photos in the Washington Glass School’s flickr album – click HERE to jump to SOFA Chicago album. Or- want to see a short local PBS (WTTW) vid? Click HERE. 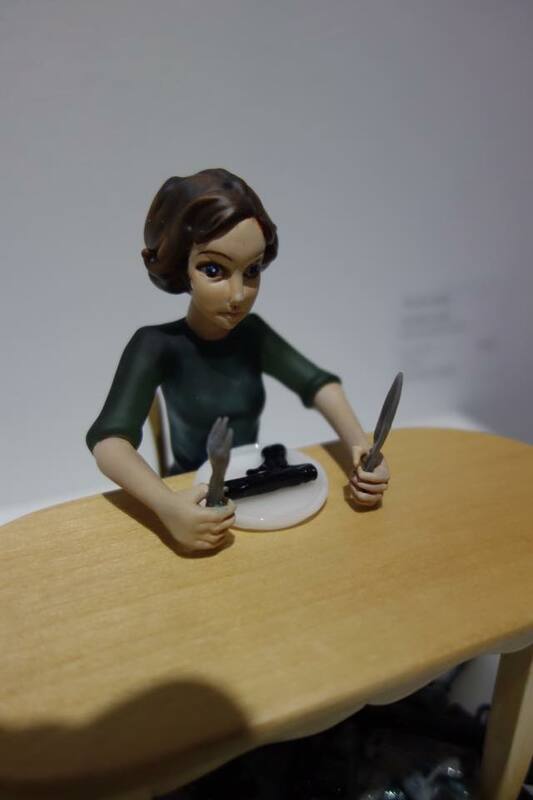 Detail of “The Gun Eater” by Carmen Lozar. Carmen Lozar’s “The Gun Eater” at Bender Gallery.